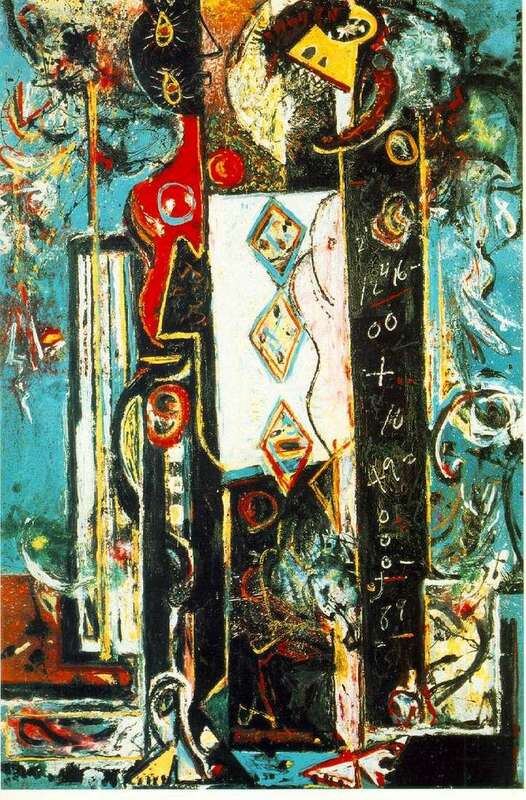 Coming out of a psychiatric hospital in early 1939, Pollock continued his treatment with psychoanalyst Joseph Henderson, a faithful confessor of the Jung system. At the insistence of the doctor, Pollock cleared his subconscious for 16 months, spilling out negative images and experiences on his paper and canvas – there one after another monsters, predatory animals, sinister characters and mysterious idols appeared. In many ways, these works by Pollock resembled the work of European surrealists, most of whom, by the way, moved after the start of World War II, to New York. During this period, the art world of Pollock was a bizarre mixture of European surrealism, the solemn realism of Benton and the creatures of his own subconscious. Description and meaning of the painting Male and Female by Jackson Pollock.